Eternal snow and glaciers occupy approximately 4 % of the territory of Kyrgyzstan which is about 8 thousand km2. Inylchek is considered as the largest (60 kms) and fastest glacier of Kyrgyzstan having two sleeves named Northern and Southern Inylchek. It is located to the east of Issyk-Kul lake on Khan-Tengry massif, the most high and remote part of all Tien-Shan. The area is characterized by powerful glaciations. There are many above 6000 m summits (Khan-Tengry Peak (6995 m) is the highest among them) and Pobeda Peak (7439 m) here. 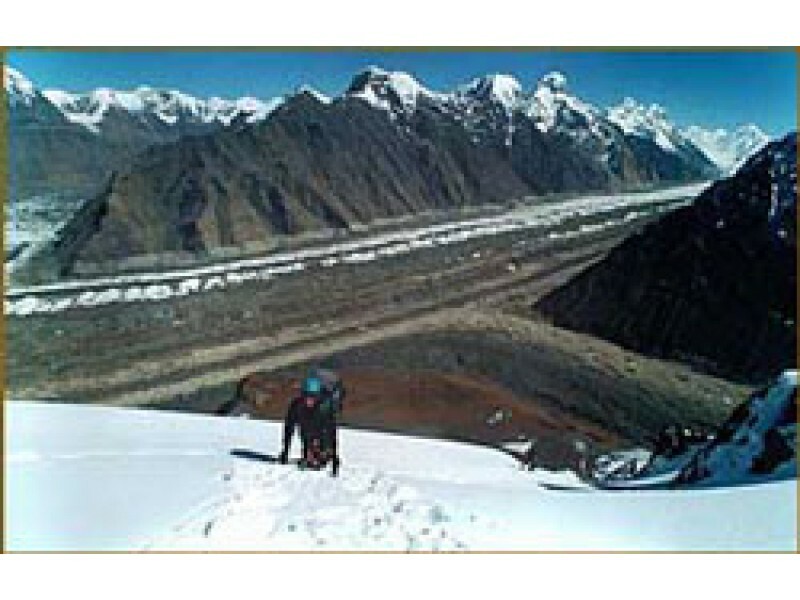 Southern Inylchek is the largest glacier of Tien-Shan and second in size mountain glacier among CIS countries after Fedchenko glacier on Pamir mountains. It is located between Tengry-Tag and Kokshaaltau ridges. It is 58,9 km in length and has 17,2 km2 area. 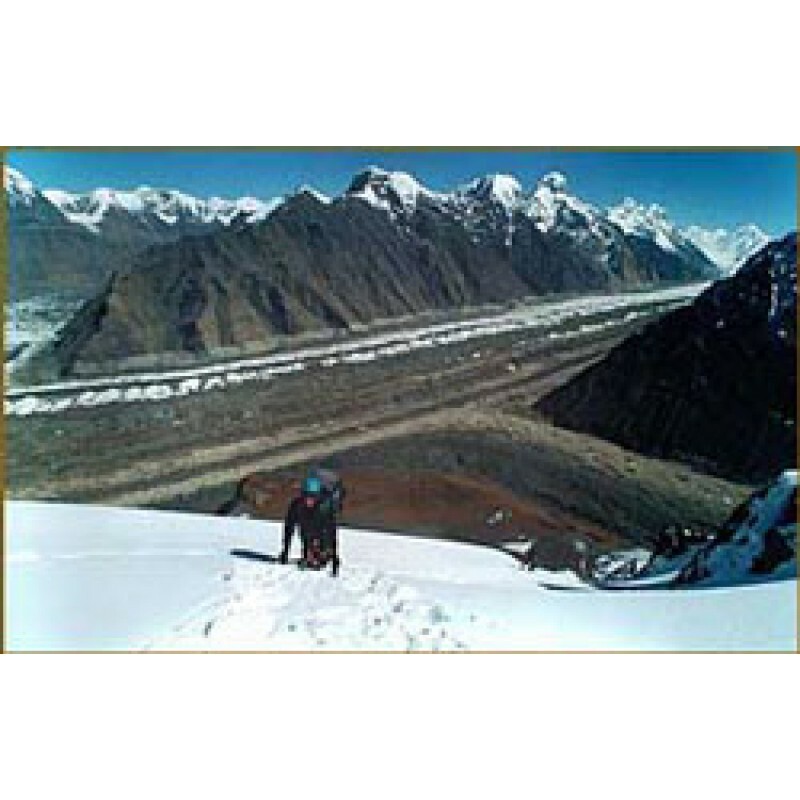 The glacier starts in Khan-Tengry area and has 43.2 km length tongue, having 2.2 km average width, falls up to 2800 m. Southern Inylchek flows in few kilometers to the north and then sharply turns to the West. The ice thickness is 150-200 m in bottom parts of its body. Powerful left inflows of the glacier lie in the northern spurs of the mountain range Kokshaaltou. They have their own names: Starlet, Wild, Proletarian traveler and Komsomol (from the East due the West). If a traveler takes a look at the glacier from the flight of bird, he will see with dark longitudinal stripes of moraines on its main trunk. He will also see the series of light branches of different length and thickness. The big glacier Northern Inylchek slips down due west between two mountain ranges Saridjass and Tengritag. Its length is about 30 km. 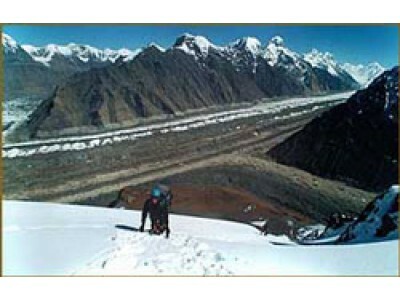 The glacier is difficult to reach as its valley located between two tall mountain ranges. The mouth of the glacier is corked with the unique glacial lake Mertsbakher. The unique glacial reservoir of irregular shape with floating icebergs is named after the explorer of the Tien-Shan Mr.Mertsbakher.The lake is located in the joint of the Northern and Southern Inylchek. The originality of the lake is in its rapid restoration after often disastrous deluges. Annually, the lake break through its limits down to the valley in the first decade of August. The waves can carry ice blocks as big as a small house. The lake gets its maximum in the middle of the end of August. It breaks through iced walls of the glacier and push down the canyon due to the mouth of the river Inylchek.